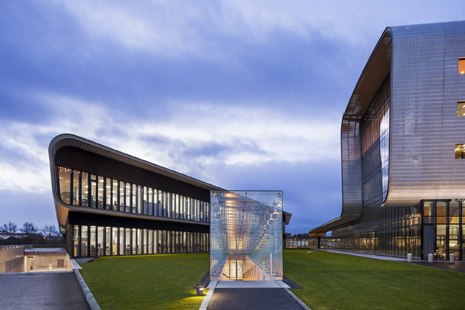 Late October 2015 saw the completion of a 200,000-square-foot expansion of the Vacheron Constantin Headquarters and Manufacturing Center outside of Geneva, adjacent to the landmark building designed by BTA and completed in 2005. The new two-story building greatly increases production and office space for Switzerland’s oldest watchmaking company. The structure continues the architectural vocabulary of the original building, featuring a curved metal roof unfurling over a glass curtain wall, while establishing a distinct presence through its low profile and angular shape.